For over a century The Carlyle Johnson Machine Company has manufactured quality industrial electromagnetic clutch units. We offer a complete product line of electromagnetic clutches and brakes, including some of the industry's leading industrial electromagnetic jaw clutches, pulley clutches and more. All of our electromagnetic clutch models can be modified to meet your specific needs and requirements. Our industrial electromagnetic clutches offer torque ranges from 12-5000 lb. ft. (torque options vary by model). Clutches with custom torque are also available upon request. 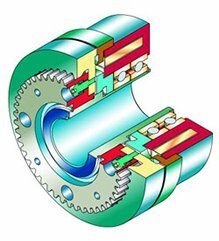 Many of our electromagnetic clutches can operate bi-directionally, and come with a range of tooth configurations and actuation set/release options. For more information on designing an electromagnetic clutch please visit our clutch and brake guidelines. Carlyle Johnson clutches and brakes are recognized for quality and adaptability, we are one of North America's leading industrial electromagnetic clutch manufacturers. Our experienced engineers are ready to design and manufacture the custom electromagnetic clutch you need, or build a complete power transmission system. If you don't see the electromagnetic clutch you need here please contact us – many of our industrial electromagnetic clutch models do not appear in our standard catalog, and all of our electric clutches can be customized. At CJM we are dedicated to solving even the toughest power transmission challenge. Carlyle Johnson works to ensure our Electromagnetic clutches provide a long operational life and deliver the best return. We repair and perform maintenance on all of our parts, and quickly return serviced industrial electric clutches. We also routinely upgrade, retrofit and overhaul electromagnetic clutch units, extending life spans and repairing clutches that are no longer available for replacement.